STACS-CW Enterprise helps forensic DNA labs save time processing and reporting sexual assault kits. "DNA crime labs can easily track and report sexual assault kit processing to save time and reduce errors with STACS-CW." 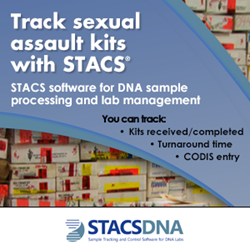 STACS DNA Inc., the sample tracking software company, today announced that STACS-CW Enterprise allows casework DNA laboratories to easily track and report sexual assault kit processing to help them save time and reduce errors. Sexual Assault kits are receiving an increased level of attention as pressure escalates for kits to be processed and victims informed of results. Due to a previous lack of tools, many forensic DNA laboratories use spreadsheets to track the number of kits in the lab and the associated processing details; for labs that process hundreds or thousands of kits, this is cumbersome and error-prone, making it difficult and time-consuming to find and summarize information and prepare reports. With STACS-CW, lab staff can save countless hours of work by having easy access to data related to sexual assault kit processing and quickly-prepared reports. In addition, STACS-CW’s lab management and integration with CODIS and statistical applications gives labs the ability to efficiently track and document consumable, instrument, and sample processing activities while also decreasing the potential for errors. These capabilities are currently available in STACS-CW Enterprise software and are in use in labs across the Unites States. STACS-CW has been proven to increase DNA lab productivity by more than 40% —with no new hiring, and no need to acquire or replace a lab’s current LIMS. As the most comprehensive forensic DNA sample processing software, STACS-CW provides sophisticated tracking and lab management to save time, prevent errors, cut costs and improve data quality. STACS DNA delivers sample and kit tracking software specifically designed for forensic DNA casework and database labs. Since 2000, STACS DNA’s solutions have addressed the shortcomings of many current LIMS by providing an automatic audit trail, DNA-specific workflows, CODIS and instrumentation integration, automatic grant tracking and unmatched professional services. Most of the major forensic DNA labs in the United States are our customers, along with the U.S. Army and the RCMP. STACS DNA is based in Ottawa, ON and Fairfax, VA. For more information, visit http://www.stacsdna.com.